“You’re like twice my age” she giggled without breaking eye contact, a playfully standoffish smile creeping across her face. I wanted so badly to disagree with her. First of all, she most certainly was not 15, secondly, she was the embodiment of a gift to the senses, carefully wrapped in the trappings of a 22-year-old beauty. The universe had well designed this one, a smile that instantly brought the mind to the present moment and a halter top which instantly took the mind anywhere but. Regarding her comment, I felt that the reason for my mental objection was not grounded in my knowledge of basic mathematics, but rather somewhere much deeper in my soul. As we danced together over the course of an evening, it felt as if there were magnets behind her eyes; I felt pulled toward her like tractor beam, my full attention being abducted into the depth of her being. My curiosity was firmly rooted in the present moment, at least when I managed to keep my eyes above her neckline. I wanted to know her, to see where this magic smile came from, but not in the textbook sense of understanding a person, rather I wanted to know her through experience, I wanted to learn how that smile comes to be simply by watching it happen over and over again with unrelenting marvel, like a child looking into a sunset for the first time. Her harmless comment about our separation snapped me back to a decidedly less magical interpretation of reality. I asked myself if my disappointment was connected to my ego, is the concept of James going to lose some footing over this charmer, who now is failing to offer herself as a reflecting pool to bolster my own narcissism? No, upon further review it wasn’t quite that. There may have been a time when that would have been the case, but at some point in these 30 years I’d learned to love myself, the person behind the image, and I no longer reduced the eternity of another to a simple mirror. My disappointment wasn’t self-interested. I wasn’t sad due to the minor ping of a semi-rejective statement, but more feeling the sting of a perception so strongly tied to what the world tells us people are, and therefore instructive to the misdiagnosis of how we come to understand ourselves. I tend to feel drawn to young people because they haven’t learned themselves so far away from who they are like the rest of society. The journey of self-expression is much shorter and more enjoyable when not saddled with a multi-year commitment to self-repression. This girl epitomized the pure truth that “life is beautiful” but it was like she didn’t even know it. She was so free in action, genuine in presence, and only confined by perspective. Perhaps it’s my optimism that she was also experiencing the same attraction that I was, as her words betrayed a captivation with the labels of the world and our collectively agreed upon adherence to them. At one point in the evening’s banter, she poked that I should “find the woman of my life.” I can only assume that this kind-hearted recommendation was born out of some recognition of the good in me, coupled with some compassionate sentiment that I not die alone. What a misunderstanding of this life it is to hide under the rocky comfort of a relationship in the belief it helps us escape the experience of our last moments. Companionship is beautiful, but not if wrought out of a desire to avoid coming to terms with our place in the universe and just what we are or aren’t. The final realization of our existence isn’t to be feared at all! It’s to be recognized and celebrated so long as this form allows. When a person knows their inherent beauty, love, and value as an integral burst of energy it the vortex that is life, then companionship becomes all the more beautiful. To be together is to feel the pull, to observe the smile, and to smirk lovingly at your wondering eyes and thoughts. The idea of how many times the earth has rotated the sun since our umbilical chord was cut determining our personality, goals, and values is incredibly simplistic. There is certainly a correlation between age and wisdom, but it is hardly a causation. The sentiment of Benjamin Franklin that “most men die at 25 but aren’t buried until they are 75” illustrates this well, as the frightful conditioning of the soul is a better barometer for loss of life-force than birthday candles blown out. As I learned on my first trip to the personal trainer, there is a metric known as metabolic age. This term is a way of measuring the wear and tear on our body based on relevant data such as body composition, range of motion, bone density, and other health-related factors. Attaching significance to the wrong metrics leads us to inferior action. This phenomenon is evidenced by just how hard it has been to shift cultural perception of a woman’s weight being particularly relevant to her health or attractiveness. There are still girls fighting the number on the scale, even though gravitational force is not a particularly seductive attribute. Science says muscle weighs more than fat; history, statistics, and anthropology show us that a certain curvature to the female form is evolutionarily preferred, but the myth of the scale being important lives on. Wisdom comes when it comes, often provoked in spurts of necessity by the varying events of our lives. This only changes when we set an intention to always be learning and growing, but again, the place from where we make that promise requires us to connect to our own curiosity and creativity, something it’s easy to learn not to do when faced with the square-peg-round-hole dilemma that is the modern school system. Consider for a moment the assertions by many people on the forefront of technology that those of us still alive in the next 30 years will likely live 100 more years on top of that. Ray Kurzweil, the head futurist at Google, is widely known for his savagely accurate predictions for humanity’s technological future, and he feels strongly that living to 180 is not only realistic but probable. Renowned bio-hacker and entrepreneur Dave Asprey echoes these sentiments, both men citing access to the best nutrients from across the globe coupled with new medical technologies such as nano-particles and an ever-evolving understanding of the human body and it’s ailments as the foundations for such a belief. 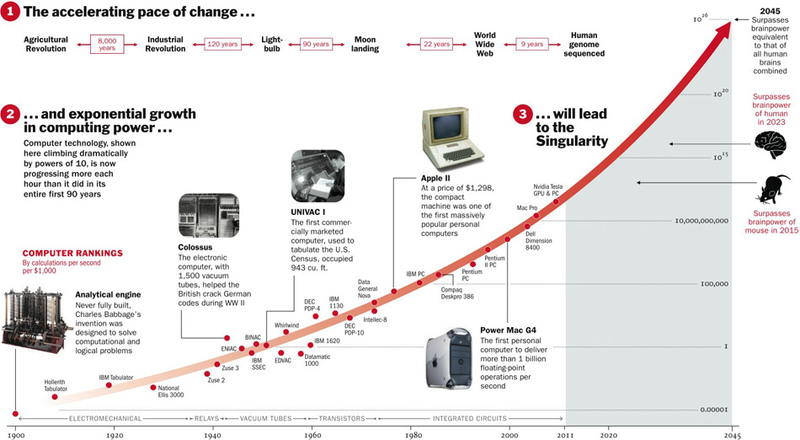 The ever-accelerating pace of technological advancement, commonly referred to as the “singularity” is carrying us toward a future where age as a cause of death will be obsolete. We have already identified a jellyfish that lives forever, and it’s not too big of a stretch to imagine we can extract some information from this to hack our own way to further longevity. We know that cells only need 3 things to live: oxygen, nutrients, and the ability to recycle their own waste. There is nothing inherent to our existence that is impermanent, in fact quite the opposite. So if the hardware will be available to sustain us indefinitely, who lives and who dies will come down software. Who among us has the foresight to plan to be alive? Who loves themselves enough to minimize their stress load, actively maintain themselves, and more than anything, choose to run good software in the form of the thoughts they allow themselves to believe in. This is why mental health and mindset are so important, and I’ve devoted my life to furthering the conversation on these issues. Your future comes down to two simple things, mindset and variance. Everything is under your control, except getting hit by a bus, leave that one up to God. Following the timeless prayer as a guide, it is imperative for us to have the serenity to accept that which we cannot change, the courage to change what we can, and the wisdom to know the difference. Accept the number of candles on your cake, unleash the person hiding under the communal pressure of expectation, and never try to experience a smile with your mind. 100 more years is a long time to act out the role you were assigned, but it’s only an instant to be yourself. Break from the mold and inspire the energy around you. The future belongs to those who believe in the beauty of their dreams. It’s as true in life as it is for lovers. Like a cosmic dance, our moments are both fleeting and forever, it’s just a matter of waking up to the experience. Everybody sleeps, but not everybody remembers their dreams.